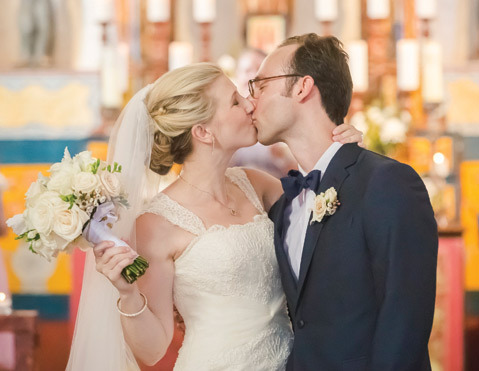 Megan Barnett (left) and Grant Hermes, who met as undergrads at UCSB, were married at El Presidio Chapel in August 2013. Megan wore a dress from Panache Bridal, and the couple chose the University Club of Santa Barbara for their reception. A wise woman gave a young bride these words of advice: Don’t let the wedding become more important than the marriage. In this age of reality television and weddings that take as much effort as producing a movie, it’s easy to lose sight of the true meaning of the day. Best advice: Follow your own heart and sensibility, do what feels right to both of you, and forget keeping up with celebrity couples. This year’s wedding guide is designed to make planning a wedding easier, to take some of the anxiety and stress out of it by bringing a host of resources together in one place ​— ​from venues to cakes to flowers to photographers. Also included in this issue are the stories of a couple betrothed for 71 years, a reverend who was finally able to marry his long-term partner after the repeal of Proposition 8, and a bride’s metamorphosis into Bridezilla and back.